The SIM T-DRAIN® evolves from the already known and approved SIM DRAIN. Both of these drainages are the result of clinical research on high absorbance textiles, particularly silk: studies have demonstrated the elevated drainage capacity of this material. The most remarkable results during the course of this research were shown by the specific absorbance of pure fibrin at the drain extremity within the drainage site at the moment of removal, and the great amount of liquid, including blood, that drained by capillarity into the collection bag. Thus a drain was designed using a cord of special, high capillarity multifilament textile material (silk) and a “Redon” type radiopaque medical grade silicone drainage tube as the “container” for the textile cord material. In this way, the most liquid part of the drainage exudate drains off into the collection bag and the fibrin part collects on the cord surface, thus delaying the occlusion of the drain section. In the event of drain occlusion the multifilament cord can be removed easily to renew the free flow while leaving the drain in place and without painful repercussions on the patient. The same is true for the removal of the drain itself, which being made of silicone, slides out easily along the channel in which it was placed. The special “Y” connector permits easy cord removal and the resulting “cleaning out” effect will renew the normal drainage activity in the event of occlusion, thus avoiding the need for long and complex manoeuvres on the part of the medical personnel to try to reopen drain flow. These characteristics are those of the SIM DRAIN. 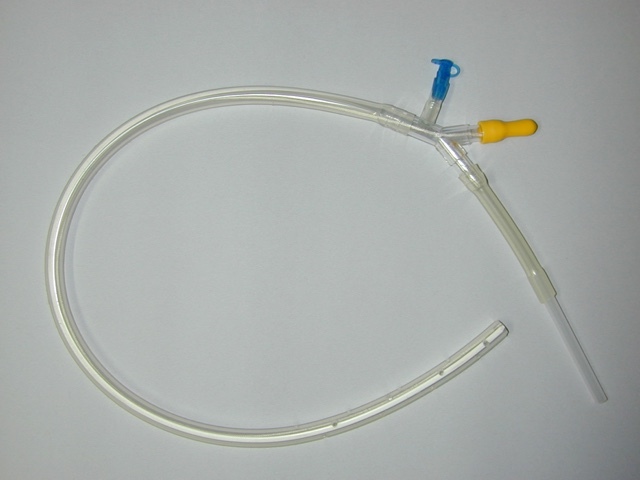 The SIM T-DRAIN® maintains all the characteristics described above, and includes an important innovation which consists of having an internal lavage channel inserted inside the Redon drainage tube which is not a part of the outer Redon tube, but is an independent entity of greater strength than silicone, which is capable of dislodging eventual coagulates and making their removal easy while maintaining the drain free flow. A further advantage offered by this characteristic is to allow a more efficient, local action directly on the area of the surgical operation, maintaining the zone clean and medicated. For further information, please see Sim Duodenal Drain.